Now a major film starring Logan Lerman. You can't tell by looking at me that my dad is Poseidon, God of the Sea. It's not easy being a half-blood these days. Even a simple game of dodgeball becomes a death match against an ugly gang of cannibal giants - and that was only the beginning. You can't tell by looking at me that my dad is Poseidon, God of the Sea. It's not easy being a half-blood these days. Even a simple game of dodgeball becomes a death match against an ugly gang of cannibal giants - and that was only the beginning. 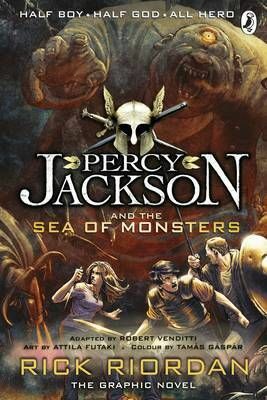 Now Camp Half-Blood is under attack, and unless I can get my hands on the Golden Fleece, the whole camp will be invaded by monsters. Big ones ...This full-colour graphic novel is adapted by Robert Vendetti, with art by Attila Futaki and colour by Tamas Gaspar.